Washington, D.C., February 27, 2015 - The Washington International Horse Show (WIHS) is pleased to announce it has once again moved up the standings in the North American Rider's Group's (NARG) yearly report of the top 25 horse shows in North America. A consistent presence in the NARG Top 25 since the report was created in 2012, WIHS endeavors to provide an innovative and exciting program of sport and entertainment. resented by Events DC at the 56th annual Washington International Horse Show (WIHS). 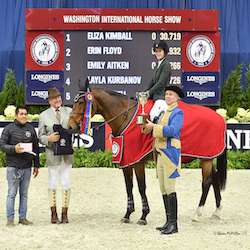 "The Washington International Horse Show is one of the country's most celebrated and historic competitions, and we are honored to be recognized as one of the best events in North America each year," said WIHS President Victoria Lowell. "Our team works hard to make the show something special for competitors and spectators alike." 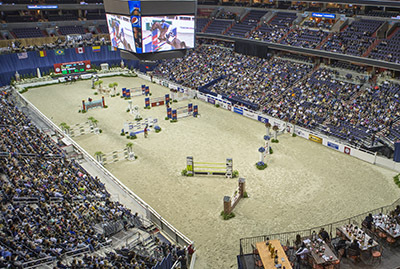 ring of Verizon Center making way for thrilling world class equestrian competition. NARG evaluations focus primarily on the quality of the experience for competitors, including footing, stabling, and course design as well as the experience for spectators, such as hospitality, pace, marketing, and in-area experience. "NARG is an esteemed panel made up of show jumping's most knowledgeable veterans, and we thank them for championing and recognizing excellence in our sport. We are thrilled to see they have recognized our efforts with a ranking up nine spots this year," said WIHS Executive Director Bridget Love Meehan. International Jumper Puissance Class -the pair jumped 6'10" to win the class. 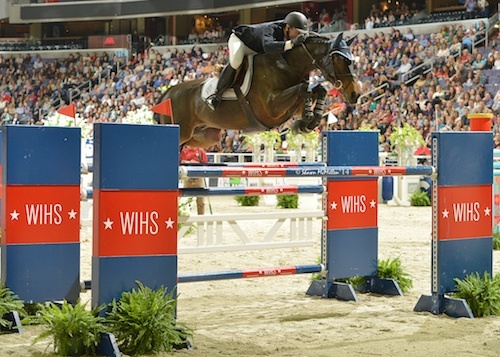 WIHS Show Manager David Distler added his thoughts to this year's very positive NARG report. "Washington is a unique show jumping competition and we strive to make it better every year. In 2014, we joined an elite group of events designated with an FEI four-star rating and we also improved our FEI stabling facilities. For 2015, we are pleased to announce we are working on a plan for new footing. At present our intention is to use material similar to what will be used at the FEI World Cup Finals in Las Vegas in April." "The Washington International Horse Show continues to be a national treasure, attended by celebrities, business, military, and diplomatic leaders, as well as horse lovers of all ages," stated NARG. "Held in the nation's capital, the beautifully managed event has an unmistakable big-city atmosphere, an excellent VIP and feels important. The urban neighborhood around the Verizon Center is magically transformed into an equestrian venue for one week every year. Ceremonies and entertainment were beautifully done, with sponsors noticeably in attendance. The professional video production and replays make WIHS a standout in terms of spectator engagement and atmosphere. For those who couldn't attend, a webcast was available throughout the week, with plenty of press coverage both locally and nationally. The WIHS team's active use of social media is non-stop, with live tweets and live feeds. NARG commends WIHS on all technical aspects. Major credit goes to the organizers and the management; Washington International is one of our best venues." 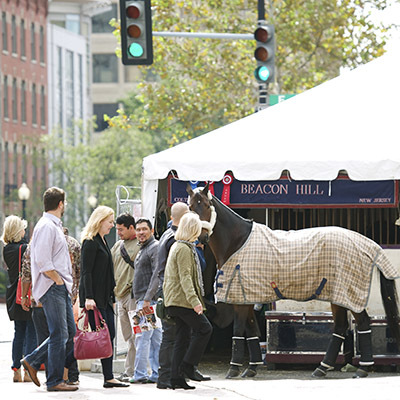 The 57th annual Washington International Horse Show returns October 20-25, 2015, at Verizon Center in downtown Washington, D.C. For more information, please visit www.wihs.org, join us on Facebook, and follow us on Twitter and Instagram. For more information about the North American Riders Group and to read the complete Top 25 of 2014 report, please visit www.narg.org. About the Washington International Horse Show, wihs.org Established in 1958, the Washington International Horse Show attracts more than 26,000 spectators to the six-day show, which includes Olympic-level competition along with community and charity events. More than 500 top horses and riders come to D.C. from all over the globe to jump for more than a half a million dollars in prize money. 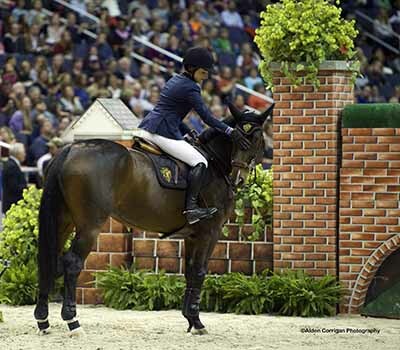 In 2014, the Fédération Equestre Internationale (FEI), the international governing body for all Olympic equestrian disciplines, elevated the show's rating to CSI4*-W for international show jumping. Event highlights include the Puissance high jump competition on Military Night (Friday), the $125,000 President's Cup Grand Prix, a World Cup qualifier (Saturday night) and Kids' Day (Saturday), a free, fun and educational community event. The Washington International Horse Show Association, Ltd. is a 501(c)(3) nonprofit charitable organization headquartered in Washington, D.C. WIHS is an official USEF Heritage Competition and is recognized as a Top 25 Horse Show by the North American Riders Group.